For any one of our ongoing clients, our most simplified endgame is to rank #1 for as many core services as possible. We all know that Google regularly refines its rules to redistribute the wealth of the coveted top spots. But what we don’t often consider is how Google changes the top spots themselves. I recently came across a mega-serp infographic on The Moz Blog that changed the way I think about search engine results pages, or SERPs. I had to share with you, and not just because I live for tacos. But because the basic top ten list is so last year. Now, before I get too sensational, I should say that Googling “The Amazing World of Tacos” is never going to get you to this flashing carnival of a results page. But for the sake of explanation, all major features are included here. The local carousel is the left-right gallery of taco places in the area. If this search had been performed in Athens, you might see listings for Taco Stand, Taqueria del Sol, and the ubiquitous Taco Bell, all associated with G+ reviews and images of food, façade, or mapped location. 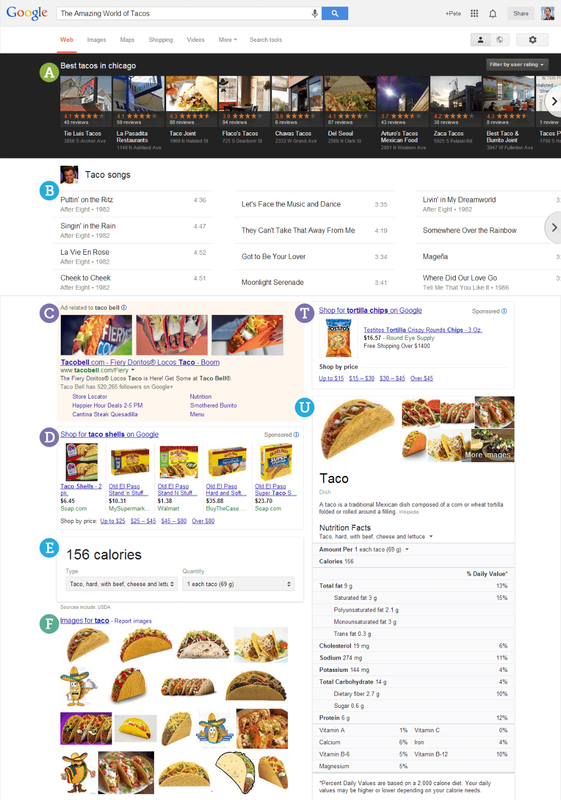 This feature popped up in response to a search for “taco songs,” and I’m glad it did. Google launched the list carousel feature a month ago, and clicking on any one song brings you to a new SERP complete with musical YouTube videos. The most common feature! 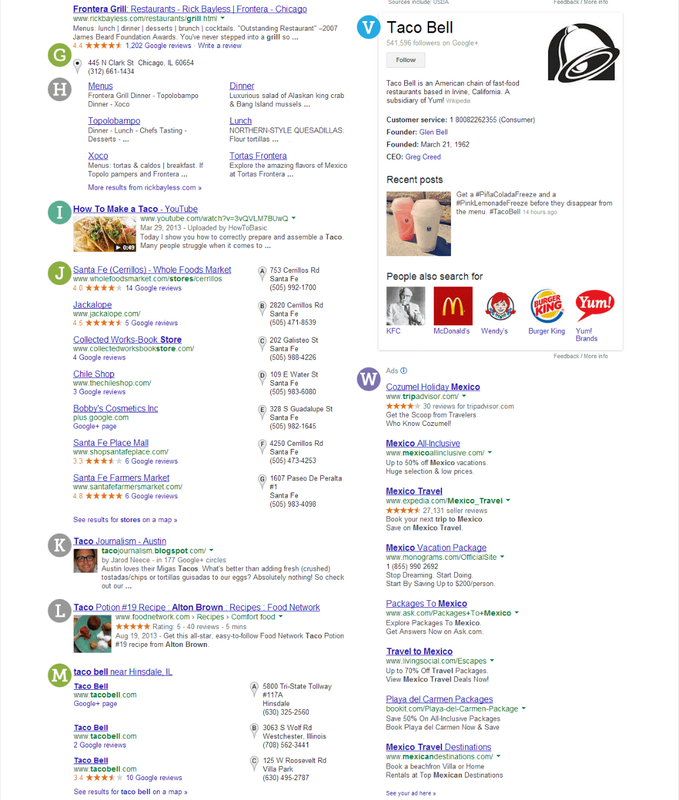 This is where paid search results are most prominently displayed, with 1 to 3 results. It looks like these ads are getting more eye-catching, as Google starts incorporating more rich media. It seems important to note that these are paid shopping results, and that they can show up on either side of the page, as Google gets experimental. If you the searcher are preparing for next week’s Taco Tuesday, this feature could be influential. The answer box comes in many forms. This one helpfully (or rudely—you choose) displays the calorie count for a single taco, and it’s conveniently located at the top left side of the page. This feature seems to only come up when searching “pictures of…” or “photos of…”. In this case it came to the party after a “pictures of tacos” search, but it sure doesn’t come often. The local knowledge panel comes complete with a page link, meta description, Google reviews, and a map pin. The local knowledge panel comes up only with organic (not paid) search, and usually from a site with high authority. Sometimes the top organic listing gets unpacked a little, since it’s so popular. In this case, we’re seeing 6 internal links to the Frontera page, but it could have more. Videos can show up anywhere on the page, and aside from a tiny still and an upload date, a video result functions just like any other organic search listing. 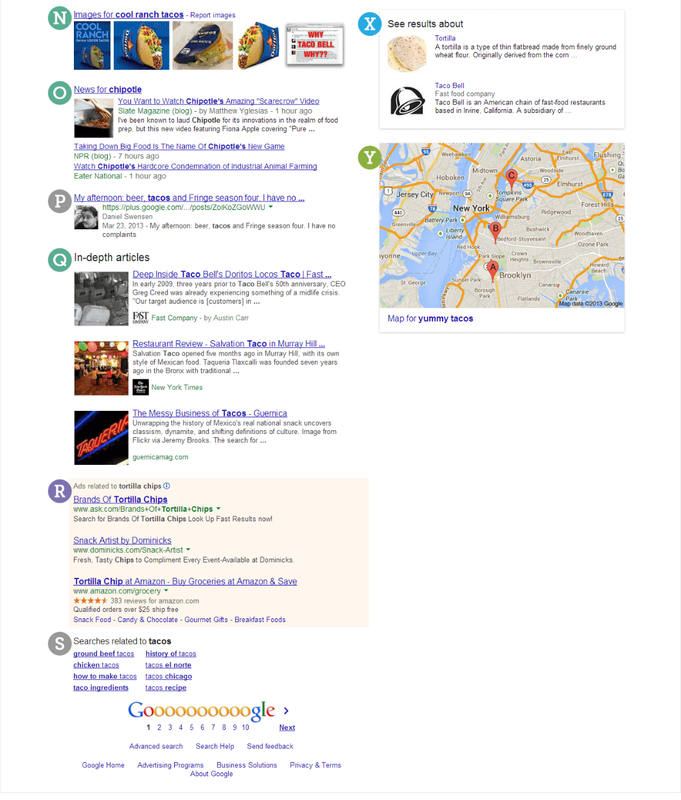 This is a block of local links that usually appears on the top half of the SERP. Packs don’t have to include as many as 7 links; they sometimes feature only 2. This is pretty cool. If Google sees that the author of a page has a Google+ account, it will display the author’s name and a thumbnail of his/her profile picture. This gives a reader the confidence to click, since there’s a human backing up that link. I’m skeptical by nature and nurture, so I love when reviews come up before I even ask for them. This particular review is for Alton Brown’s Taco Potion #19, which comes recommended with 5 stars and a thumbnail pic. Another local pack! This one helps when you need tacos right here, right now. The SERP will give you a pack of 3 nearby results, all taken from Google Maps data. This feature is directly connected to Google Images, but it shows up on the main search results page. You’ll usually see these images on page-left, and clicking through brings you to Google Image results. News blocks show up on the left, and include up to 3 links. News gets indexed fairly immediately, so you’ll usually see very recent stuff, with an image on the top link. Here’s something different. These results are totally personalized. This Daniel fellow’s link pops up only because he and the author are G+ pals. This feature is fresh from August 2013! In-depth articles come from reputable sources, seem to have a lot of substance, and can be years old. Certainly not selected based on hot new criteria. Just like the paid listings on top, AdWords Ads can appear at the bottom of the SERP, and the block can contain up to 3 listings. I like to think of this as a consolation prize. “Didn’t find what you’re looking for? Try this!” the related search feature almost always appears at the bottom of the SERP. It looks like Google Shopping is still in its experimental phase. The Shopping feature on the right usually looks just like the paid shopping results that come up on the left, but there are a few slight variations presently and in the works. This guy is often on the top right, and it predicts and features basic info about the search query. In this case, it’s nutritional facts, but in another world it could tell us something like who invented the taco, and why. This box gives you a lot of useful info, in just the way we usually think of the knowledge graph… but in this case it features knowledge about a brand. Enlighten yourself on all things Taco Bell. More ads! These are stripped down to basics, and can contain as many as 8 results per block. This box appears when Google doesn’t quite know what you’re looking for. In this case, you can delve deeper into taco shells or Taco Bells, whichever you prefer. Visualize it! If you see a local pack, you should see a map, too. And unless it’s a traffic map, it’ll be on the right side of the page. I’ll be the first to tell you that the mega-SERP is a lot to digest. But what a great guide to Google. Thanks to Dr. Peter J. Meyers for testing, assembling, and writing this killer reference. For more technical info about testing, data, and the function of each feature, head back to the original post! I’ll just be over here eating tacos.